The Skill/Level Category drop-down value is used to group or classify your Student Skills/Levels. The Skill/Level Category is assigned to each Skill/Level you create and is a search criteria option available in the Student Skills/Levels Search. 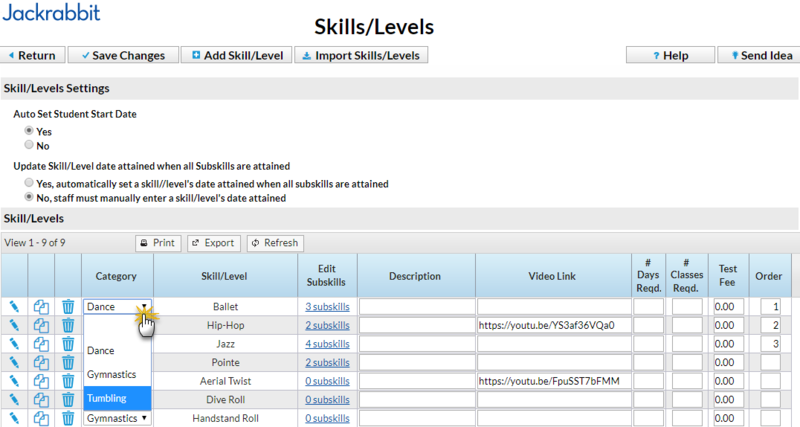 You can edit the Category assigned to a Skill/Level from the Students menu > Skills/Levels. Skill/Level Category drop-down values can be added from the Tools menu > Drop-down Lists > Student section.